I always feel, when I pull this bad boy out of the cupboard, that we’re part of the Bugs Bunny/Roadrunner Hour. Acme was always the brand that the Roadrunner featured and it always puts a smile on my face when I use it. My parents bought this centrifugal juicer back in the 50’s – sometime after my brother, George, was born in 1956 and before I arrived in 1959. Lots of fruit and vegetables have been juiced in this machine and I am so grateful to have it with us in Cabo. Getting the juicer here was no small feat. It’s heavy, and I mean REALLY heavy and there was no way that it was ever going to be part of my luggage. Mom’s neighbors and friends, Rob and Kathy, drove down every year from Alberta to Vicente Guerrero, a small puebla located on Highway 1, approximately 175 south of Tijuana, Mexico. They come, at their own expense, to do missionary work at the orphanage located there. We admire their commitment and selflessness very much. Anyway, Rob and Kathy agreed to stow boxes for me for three different years so that I could get some of my heavier articles here. The Acme juicer arrived last winter and we were so grateful to receive it. After my parents bought it, my Dad belonged to a health club that had a steam room. Dad loved onions and decided to make onion juice for himself using the Acme juicer. It seemed like a good idea until he went to the steam room after drinking the juice. One by one, every single man got up and left. It finally dawned on Dad that the onion juice was coming through his pores and he stunk out the other steam room users. They say that a skunk smells his own smell last! I guess that was true in this situation. My Mom processed high bush cranberries in that juicer and so much more over the years. One of the highlights when I was a kid was the treat of fresh carrot juice when we dug up our garden. I loved carrot juice then and I absolutely still love it now! Some years ago, the lug nut in the centre of the machine stripped out and I was desperate to find a replacement. The internet is a wonderful thing as I located a parts provider in Minneapolis, MN, who sent me the part I needed to keep the juicer going for a few more decades (this machine was definitely made to LAST!)! 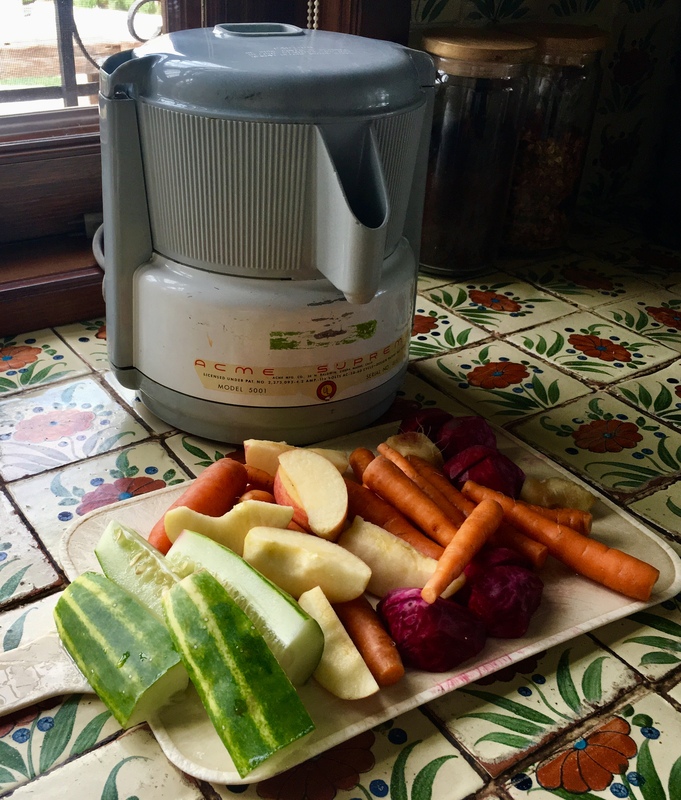 The other day I dug out “Old Faithful” and did up a batch of juice using fresh organic carrots and beets from our local market, ginger, apple and cucumber that we grew in our Tower Garden, ginger and apple. It was absolutely delicious and transported me to those years on the farm when we made our harvest carrot juice in the fall. Thanks, Mom (and Rob and Kathy), for finding a way to send this treasure and piece of family history to its new home in Mexico! Tagged Acme, Alberta, apple, beets, Bugs Bunny, Cabo, carrot, cranberries, cucumber, farm, fruit, garden, ginger, harvest, health club, history, juicer, luggage, Mexico, Old Faithful, onion, Roadrunner, skunk, steam room, vegetables. This past Friday night was very special. I got together with five of my very dear girlfriends for a delightful evening of connection, laughter, food, wine and general merriment! It was a pot-luck dinner and ALL of my friends love and appreciate great food and wine, so the offerings were superb. The occasion was supposed to be a celebration of three of our birthdays (Susan, Monica and me), but because I’m out of the country during the winter months, it has grown into just a great reason to get together and our group expanded to include Kajsa, Cathy and Tina. 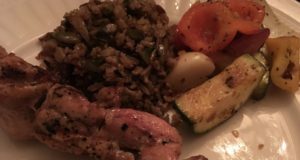 I was responsible for the appetizer and had planned to prepare stuffed mushrooms and a grilled eggplant salad served in Belgian endive. When I walked into Lina’s Market on Centre Street and saw the magnificent fresh figs they had displayed, the plan instantly changed. 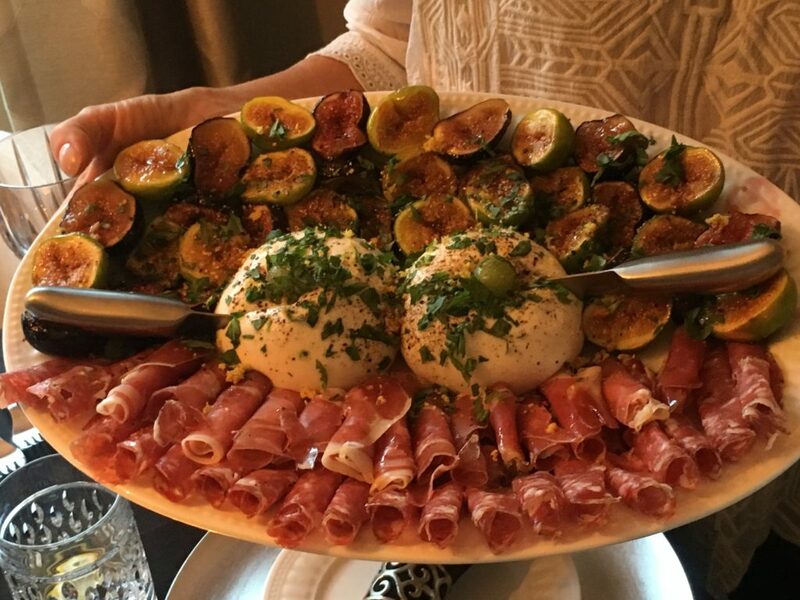 Instead I made carmelized figs with burrata cheese, with rolled prosciutto and fennel salami – the cheese drizzled with extra-virgin olive oil, fresh lemon zest, finely chopped arugula and freshly ground black pepper. To caramelize the figs, I removed the stem end, cut the figs in half lengthwise, and pressed the cut sides firmly into light coloured brown sugar. I heated a large, heavy sauté pan until hot, then cooked the figs sugar side down until carmelized (only takes a couple of minutes). Kajsa was up next with the salad course, which was absolutely brilliant. 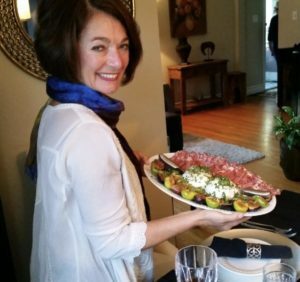 Kajsa is a caterer and is an amazing chef (as well as a cherished friend and first “adopted” daughter). She came up with this recipe after I told her about a fabulous crab salad I’d had in the JFK Airport recently. 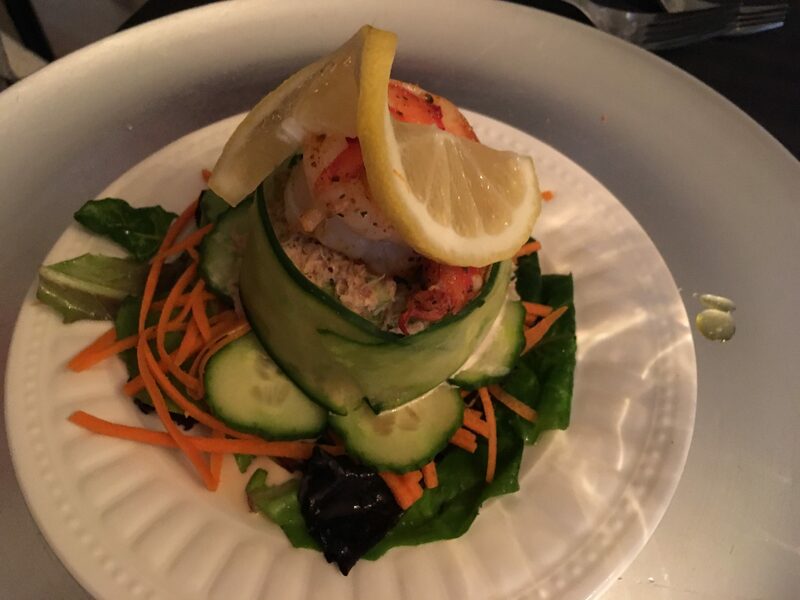 She made the salad with a combination of rock crab (from Prince Edward Island where she and her husband, Patrick, have a cottage) and shrimp, all beautifully wrapped in a ribbon of cucumber, served on a bed of mesclun greens, with threads of carrot and a thin slice of lemon to garnish. Gorgeous! None of us wanted to eat these little masterpieces, but we finally did and they tasted as incredible as they looked! Susan prepared delicious chicken skewers for our protein and Monica, another brilliant chef and our hostess for the evening, provided a fabulous rice pilaf and some marinated, grilled vegetables to complete our dinner. Kajsa had saved and brought some very special wine for all of us to share and we ate and drank very well all evening! Cathy supplied a delectable dessert of frozen green seedless grapes with ice-cold dessert wine from the Okanagan Valley in British Columbia. Dinner was phenomenal, but it was the laughter and connection shared among our group of six that made it incredibly memorable and thoroughly enjoyable! Tagged appetizer, Belgian endive, birthdays, black pepper, British Columbia, brown sugar, burrata cheese, carmelized, carrot, caterer, Cathy, celebration, chef, chicken skewers, connection, cottage, crab salad, cucumber, dessert wine, dinner, evening, extra-virgin olive oil, fennel salami, food, fresh figs, fresh lemon zest, Friday night, frozen green seedless grapes, girlfriends, grilled eggplant salad, grilled vegetables, ice cold, JFK Airport, Kajsa, laughter, lemon slice, Lina's Market, main course, merriment, mesclun greens, Monica, Okanagan Valley, Patrick, pot-luck, Prince Edward Island, prosciutto, ribbon, rice pilaf, rock crab, salad, sauté pan, shrimp, stuffed mushrooms, Susan, Tina, wine. Quinoa is an ancient grain that is a good gluten-free source of protein, iron, and fiber. 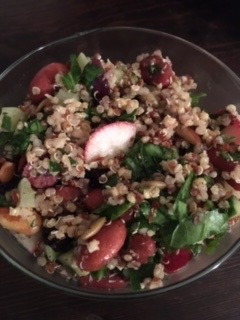 My good friend, Denise, introduced me to the versatility and nutrition that quinoa offers, and I particularly like using it in cold summer salads. Simple and simply delicious! Enjoy! Tagged ancient grain, black pepper, buckwheat, celery, cranberries, cucumber, cumin, Denise, fiber, gluten-free, Greek oregano, Hummingbird Fine Foods, iron, Italian seasoning, Kalamata olives, Mediterranean, millet, Montmorency cherries, protein, pumpkin seeds, quinoa, radishes, red kidney beans, red quinoa, red wine, roasted almonds, sea salt, spinach, summer salads, vinaigrette, white quinoa.